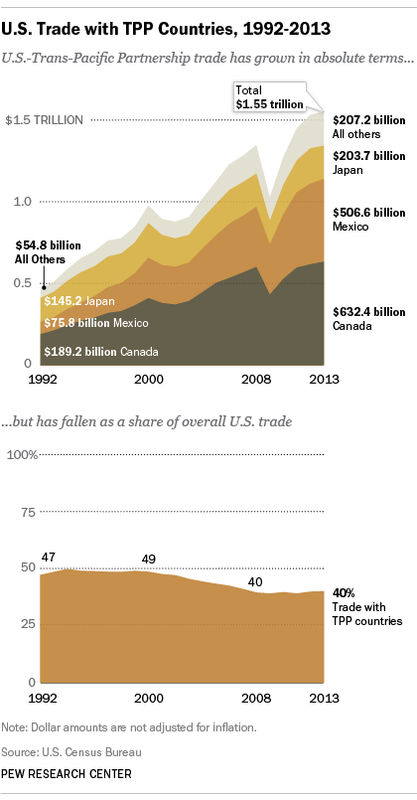 While Canada, Mexico and Japan are by far the largest U.S. trade partners in the TPP group, trade has grown faster with other, smaller economies — and not just those on the Asian side of the Pacific Ocean. Since 1992, for instance, U.S. exports of goods to Peru have risen tenfold, while imports of Peruvian goods have grown even faster. Total trade in goods with Chile grew more than sevenfold between 1992 and 2013; the U.S. had a $7.2 billion trade surplus with Chile last year. And trade with Vietnam, all but nonexistent in 1992, totaled $29.7 billion last year; all but about $5 billion of that was imports. 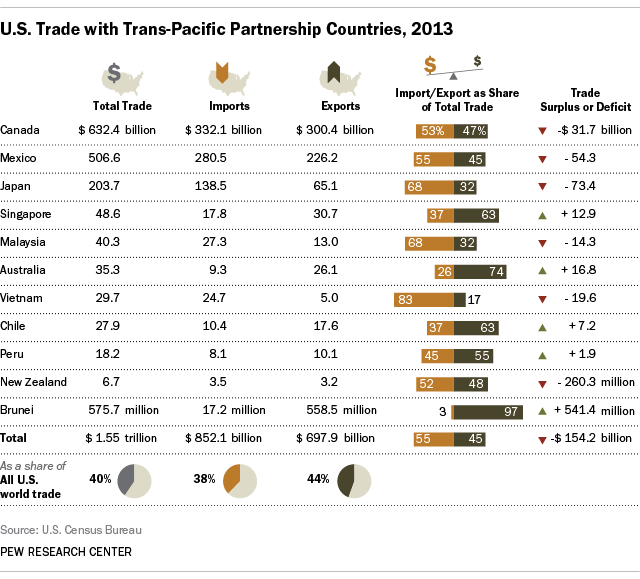 New Zealand, Singapore, Chile and Brunei joined in the original TPP in 2005 (effective 2006). Since 2009, a growing list of countries has entered talks to join an expanded TPP; there have been 19 formal rounds of negotiations. But perhaps inevitably for such a big, complicated trade deal, the TPP has been beset by controversies over everything from intellectual property to catfish.